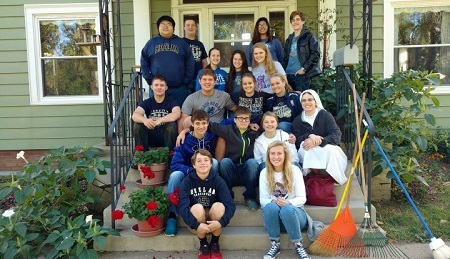 The Bishop Heelan High School staff gained a religious sister this school year – Sister Madeleine Miller, OSB. She teaches juniors and seniors in their theology classes (salvation history and social justice). In kindergarten and first grade, she went to a Catholic school with sisters. “Even at that young age, I felt drawn to the sacraments. It took years for me to fully discover that even then, God planted a desire to give my whole life to Jesus and his church,” said Sister Madeleine, who surprisingly did not grow up Catholic. After graduating from high school, she enrolled at Colby College in Waterville, Maine. While at Colby, Sister Madeleine studied political science and religious studies, while rowing on the varsity crew team. Sister Madeleine spent her junior year studying abroad in France and Scotland. Though it wasn’t in her original plans, Sister Madeleine decided her next step would be graduate school. She received her MA in religious studies from the University of Chicago Divinity School. After graduate school, Sister Madeleine continued to discern and worked for the Daughters of St. Paul in their bookstore and then did campus ministry at the University of Wisconsin-Madison. She later attended Wayne State College in Nebraska. She professed her final vows with her classmate, Sister Fidelis Marie, on Oct. 24, 2015.